A lot has been said about the Gulf Stream, and that it can be one of the worst areas of the ocean to be out on. There have been many a sailor who have attempted the journey and sworn to never go out on the ocean again. But there is a trick to it, and get it right and you can have a wonderful experience, such as we did. The trick with crossing the Gulf Stream is having mild winds, and NO north winds for 3 days before. The whole problem is that the current flows north, and if the wind comes from the north then the waves stack up. They get short and tall and make for a terrible crossing (so I've heard). It is often described as box cars coming towards you, or seeing a herd of elephants marching along the horizon. If that happens do not go out in it, and if you started out and see that, turn back and wait for better weather. The biggest mistake you can make with crossing the Gulf Stream (or with any sailing, really) is to try and keep to a schedule. Schedules will give you a bad time as you go out in weather you shouldn't because you need to be somewhere. The planning for a crossing is both easy and complicated. Until you have figured it out, this is very complicated stuff, but once you realize what you are doing it is really pretty easy. So I am going to try and explain it in layman's terms. The first thing you need to know is that with the current heading North, you leave Florida south of where you want to end up. If you start to the north and try and get south you will end up fighting the current and going nowhere. It is best, especially if you haven't done this before, to make one of the shortest trips possible. 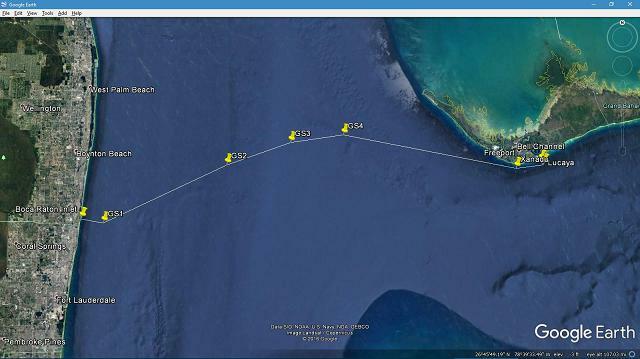 So either start near Fort Lauderdale and head to West End, or start near Miami and head to Bimini. We decided to leave from Boca Raton as we were heading to Port Lucaya. This is not a best situation for a first timer as it is nearly due east, and it's about 90 miles (nearly twice as long as required for the shorter routes). You need to know about how fast you will be traveling. For us, this was estimated at 5 knots. Now you need to know the speed of the Gulf Stream today. This is where it gets tricky as the current fluctuates in both speed and position, and it is not the same speed across the entire width of the Stream. A good meteorologist can be a great asset. We used Chris Parker and he gave us the following information for our crossing on December 28/29, 2016. From about 80W to 79-37W: current flows N between 3k to 4k. From 79-37W to 79-25W: current flows N decreasing from 3k to 2k. From 79-25W to about 79-15W: current flows N decreasing under 2k. E of about 79-15W: No GulfStream current. We used this information and we used Google Earth to do our calculations. In Google Earth draw a straight line from your point of departure to the destination. Along that line mark points where it crosses the edges of the Gulf Stream. So for our trip we created marker M1 at 3 miles off the Boca Raton inlet, M2 at 79 37', M3 at 79 25', and M4 at 79 15'. Measure the distances between those marks. On our trip, M1 to M2 was 19.84 nautical miles. If we pide that by our speed (5 Knots) we see that we will spend 4.0 hours in this section. Multiply that times the speed of the Gulf Stream for that section (3.5 Knots) and you can see that while passing between M1 and M2 we will be pushed north 13.9 miles. Continue this for M2 to M3 (11.34/5=2.3*2.5=5.7), and M3 to M4 (9.45/5=1.9*1=2.8). Add those three numbers up and you will get your total drift. For us that was 13.9+5.7+2.8= 22.4 miles. Now go back to Google Earth. Look at your destination and mark a position 22.4 miles South of your actual destination. We will call this Point X. Draw a line from your point of departure to Point X. Google Earth will tell you the bearing of this line. For us that was 100 degrees (a little south of due east). That is the heading you will take for your voyage. You do NOT try and sail along this line. Instead you aim your boat at 100 degrees and go. You will be pushed north off this line, that is okay. I went a step further and did the following. I added a line between all the points and Google Earth said that my total distance traveling was 94 miles, so I now had a good idea that my trip would take 18.8 hours (94 / 5). This gave me for markers that I added to my chart plotter. While I entered them as "waypoints", I did not use them as such, and did not try and get to them. They were simply reference points to see how my voyage was going. Here is a snapshot of what Google Earth looked like. We left Boca Raton and I set the auto pilot to travel on a course of 100 degrees. We passed pretty much right over GS1, as was to be expected. As we then entered the fastest part of the Gulf Stream we were pushed northwards, though the boat was always pointed 100 degrees. So, how did we do? When we passed GS2 at 8:12 PM we had been running for over 5 hours and we passed 0.499 nautical miles to the north. At 10:33 PM we had been running on a heading of 100 degrees for over 7 and a half hours without changing the steering at all and were 0.809 miles north of GS3. At 12:22 AM after maintaining 100 degrees for nearly 9.5 hours we passed 0.778 miles north of GS4. We were only 3/4 of a mile off from where we expected to be! At that time I then told the chartplotter to create a route from our location to Port Lucaya and engaged it. It took another 7 hours, but at 7:30 AM we were tying up to the Customs & Immigration dock. The total time was 16.5 hours, about 2 hours less than expected. We could have pushed faster with more sail up, but the sun was only due to rise at 7:02 AM and there's no point arriving in the dark as you'd have to wait off shore in deep water before coming in. In The Bahamas very few ports have lighted bouys or channel markers, as it turns out, Lucaya's are very well lit and marked so we could have come in in the dark. But still, the Customs & Immigration aren't open during the night anyway.